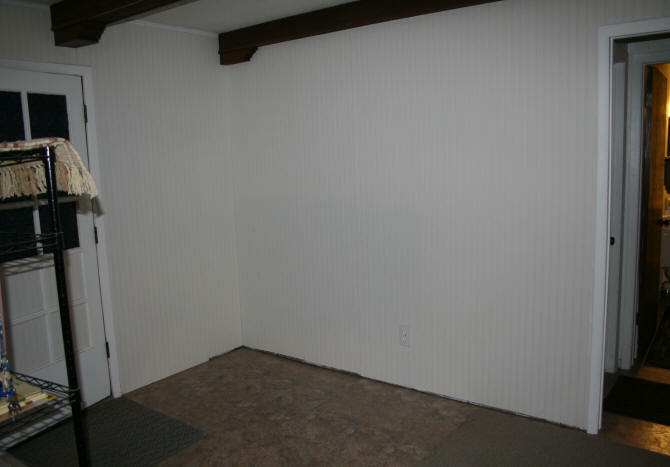 Back down in the lower level of the house (the former man cave), there was a corner that had nothing in it. (See photo below) Well it did have some free standing shelves standing there with an assortment of dog, gardening items, and the tools I was using downstairs for my projects. Since I was craving more storage after making my hearth shelves, I started thinking about building a closet in this corner. When I had wallpapered this room to cover the dark wood paneling, I had already planned the closet, so I did not put any floor moulding against this corner of wall. Corner to build a closet. Moulding left off bottom of walls when wallpaper was hung. 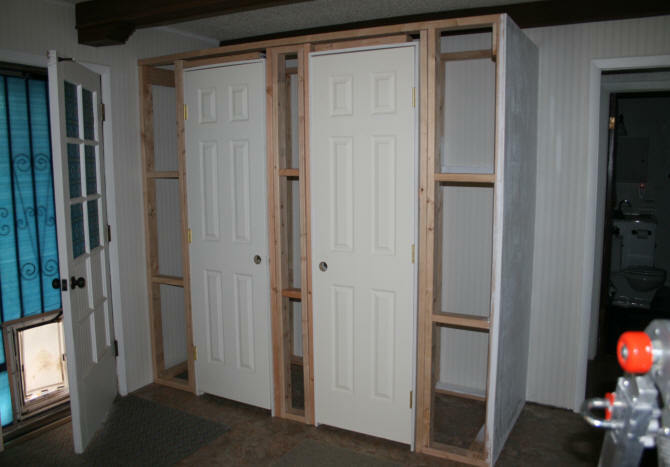 When looking for design ideas on the internet for building a closet, I did find quite a few websites and YouTube videos. 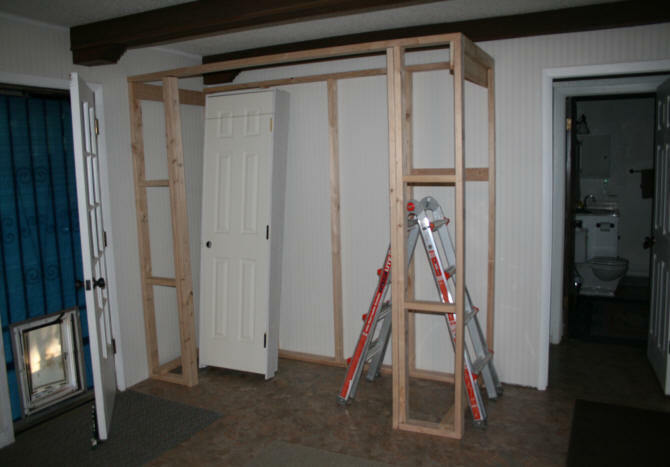 Pretty straight forward, build a frame, attach frame to studs in existing wall , attach walls, add door, then finish up with paint and trim. The only thing I did not like was anchoring it to the floor. The floor under the vinyl tile is cement. I decided not to anchor the closet to the floor at this time. Again, I decided to take a wait and see approach. If the closet slid around after it was built or later, I could add the bolts through the 2 x 4's into the floor. Again I worked out the design of the closet in my graphics program. The corner of the room measures about 9' x 4' feet. I did not want the closet to go all the way to either door frame. The dimensions I decided upon were 8' x 3' with the height being 86", just below the faux wood beam. 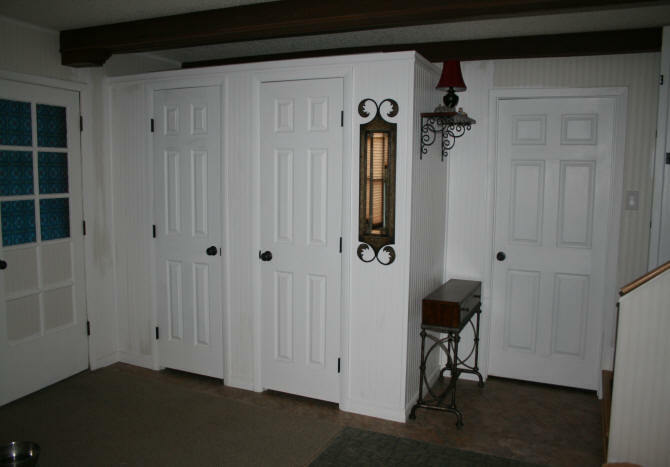 I intended to put a ceiling on top of the closet so when you came down the stairs, the closet would look finished. It would also provide extra storage space for long flat items on top. The photo above shows the wall section of the closet resting against the wall. The 2x4's are spaced 2 feet apart. Of course none of the 2x4's hit exactly where a stud was. So I attached 2 additional pieces of 2x4's on the first and fourth section of the wall frame and attached them to the existing wall studs. 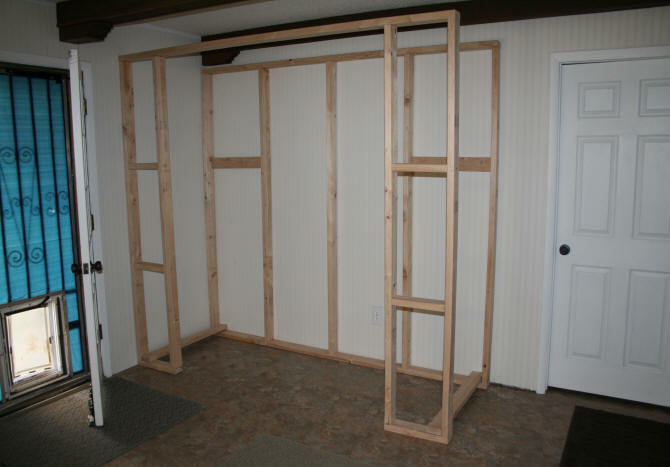 I then created the frame for the front of the closet. I first attached it at the bottom and then at the top with spare 2x4's and wood that I had. 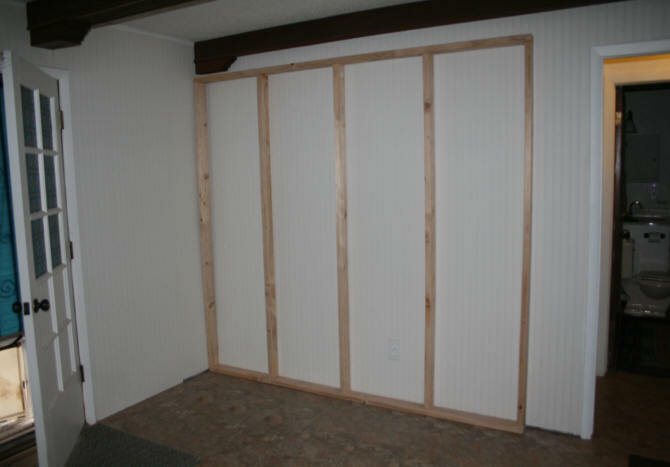 I then anchored the frame to the short wall on the left. Front and back frame attached at the top. Front frame against wall, attached to wall. Framing of door area started. I purchased two 24" pre-hung doors. The closet was small enough for one door but I wanted two doors for easier access into the closet. I did not want sliding doors. I created the door frames for the doors and the frame between the two doors. The only problem was the top of the door frames. There was barely enough room to add the 2x4's to the top of the door frames. 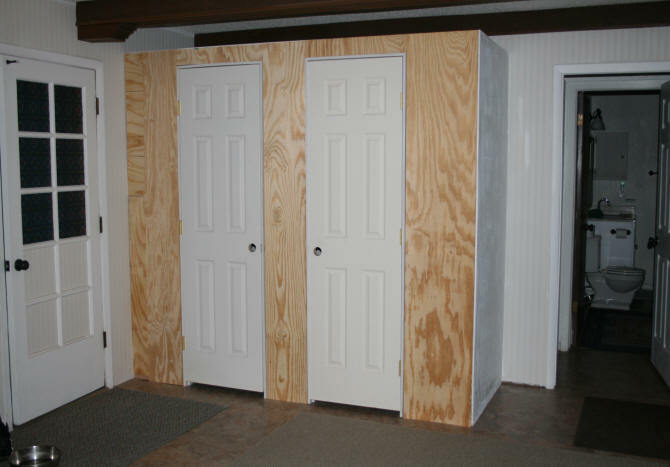 Those 2x4's in the photo below are just scraps sitting on top of the door. I did actually place 2x4's above the door frames after the photo. I added the wall to the right side of the closet with 1/2" plywood. I hate drywall. I planned to put wallpaper on the wall, so it did not have to be smooth. 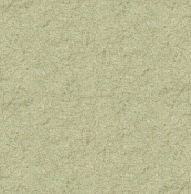 I put a coat of white paint on the new wall to prepare it for the wallpaper. 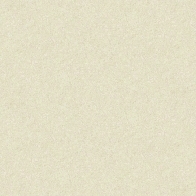 The paint is the same color as the wallpaper. For this wallpaper I discovered that having a surface painted the same color underneath helps if the wallpaper seams shrink back a little or the wallpaper is nicked. The damage is not that noticeable. 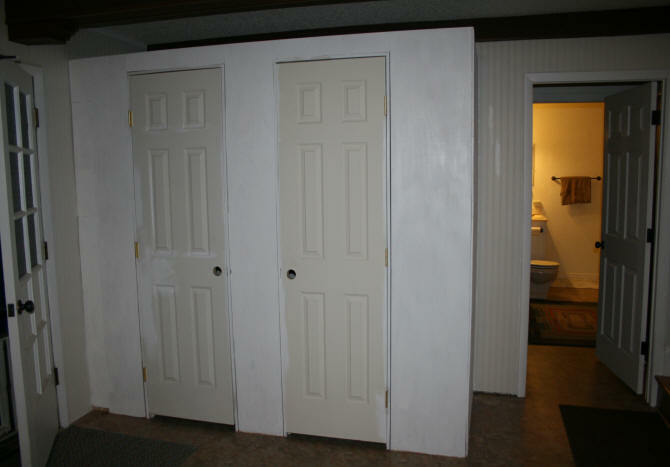 I then added plywood to the front of the closet and after painting the top of the closet, put that in place on the top. I painted the ceiling of the closet before I put it up. It would have been hard to paint on top if I did not. You can see the top of the closet when coming down the stairs. It looks nicer painted and will be easier to dust with the paint on it. I then painted the plywood in preparation for the wallpaper. 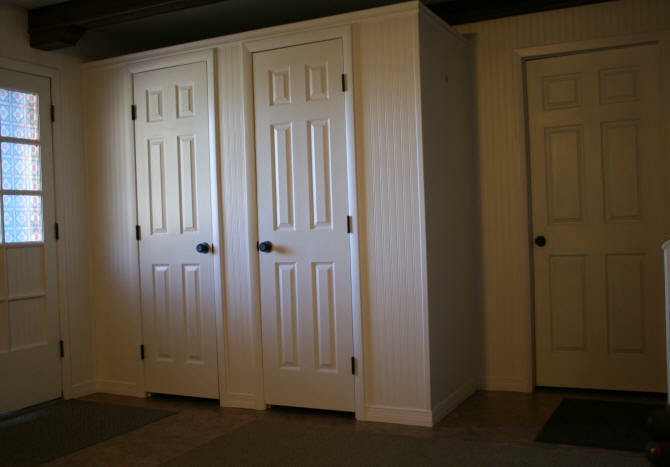 The above photo shows the completed closet. With the wallpaper pasted on and the moulding added to the doors and closet walls. The entire closet was then painted. The brass hinges that came on the doors were switched out to the same oil rubbed bronze hardware I have installed throughout the house. The inside of the closet is not finished except for paint so the 2x4's are exposed. I plan to build shelves inside eventually. In the meantime, I have a couple of stand alone shelves to store junk and large hooks to hang things like my weed cutter, etc. Here is a photo of the closet after adding some decoration and a console table. The shelf and lamp attached to the wall may seem odd, but it has a purpose. I needed a light at the bottom of the stairs that could be turned on at the top of the stairs. Since I do not have the money to hire an electrician to put a light in, I looked for other options. 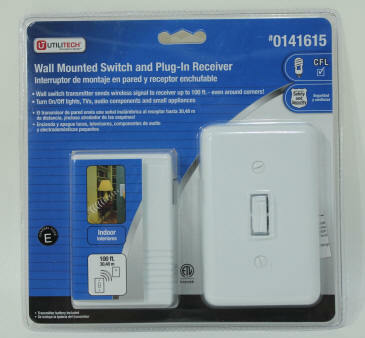 I found the Utilitech wall mounted switch and plug-in receiver, pictured at right. The light is plugged into the receiver at the electrical plug in the closet. The switch to turn it on is at the top of the stairs. The lamp cord goes through a hole in the wall which is covered by a white plastic grommet. The light operates by a radio frequency, so if you have more than one of these switches, you have to make sure they are a different frequency. I bought this switch at the hardware store for about $20. Works great! I can now go down the stairs safely. 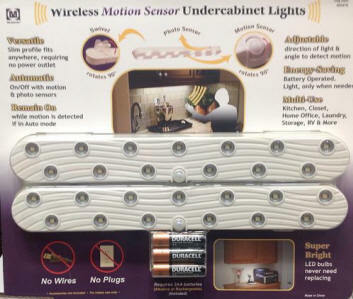 For lighting inside of the closet, I could have plugged in another light but I found these wall mounted battery operated lights with motion detectors at Costco for $20 and mounted one on each door. I angled the light toward the inside of the closet. When the closet door is opened, the light automatically comes on and goes off about a minute later when no motion is detected. Did I want more storage? You betcha!